Freedmen’s Town is a neighborhood constructed by freed slaves in 1866 on a swampy backwater that was, then, unwanted. These original settlers cleared the muddy land, constructed their own homes, and made their own bricks to pave their own streets. Over time, a series of traumas and development pressures have continued to wipe away the original neighborhood fabric and the people in them. 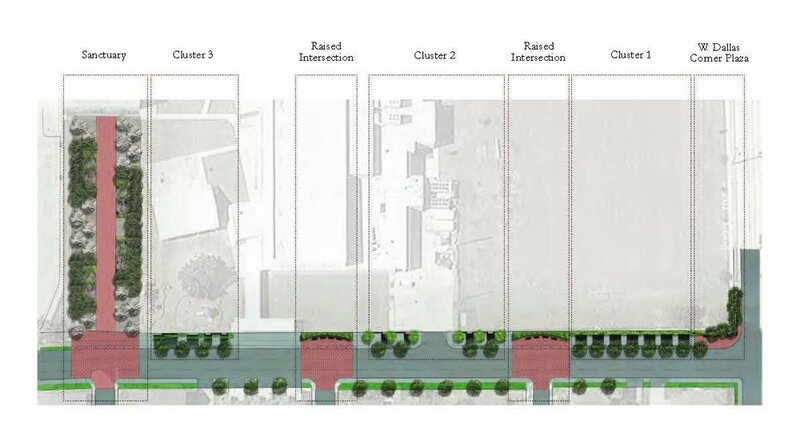 Instead of summarizing the past on a plaque, this streetscape design proposal became an exploration into the essential rhythms of the neighborhood and how a new streetscape design on Genesee Street could speak to them. The project proposes a series of black concrete panels, their color and material signifying the modesty of the structures. The design simulates the natural and artificial light and shadows that the patterned panels might cast on the street, to evoke the complex feelings associated with the memory of the neighborhood. The leaves of the proposed planting — tall grasses, banana plants, fishtail palms, and weeping willows — stretch through the cut out doors and windows, speaking to the thick, heavy, bayou edge the settlers originally cleared.